A spreading summer annual that may have an erect growth habit or grows close to the ground with tips ascending (decumbent growth habit). 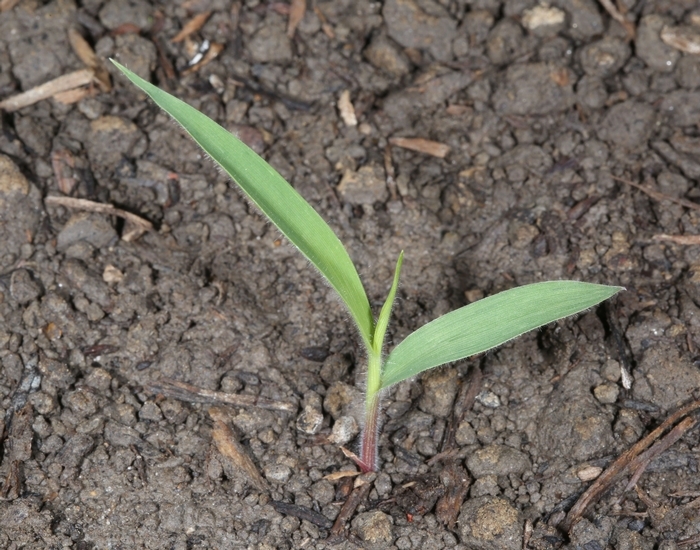 Texas panicum may reach as much as 32 inches tall and can root at the lower nodes. 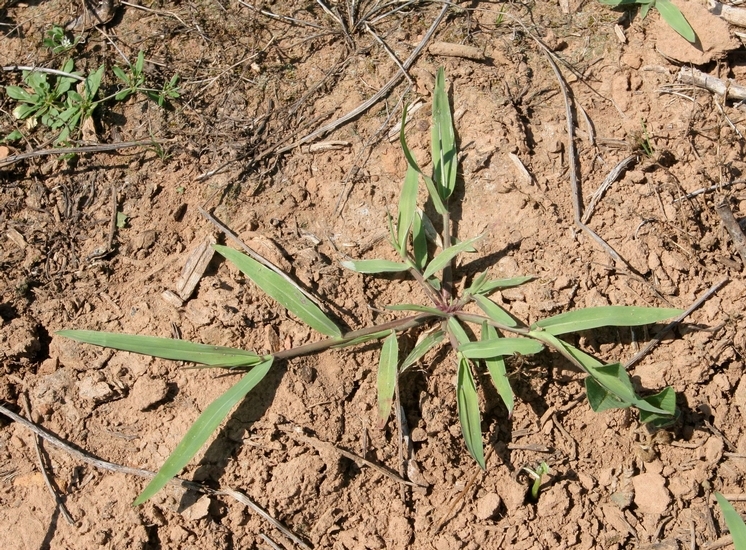 Texas panicum is found throughout the southeastern United States and has developed into a significant weed of agronomic crops. Leaf sheaths and blades are covered with soft hairs on both surfaces. 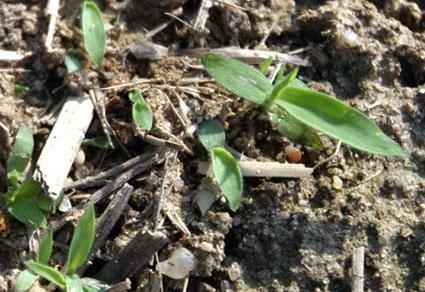 First leaves are relatively broad compared to most annual grasses. 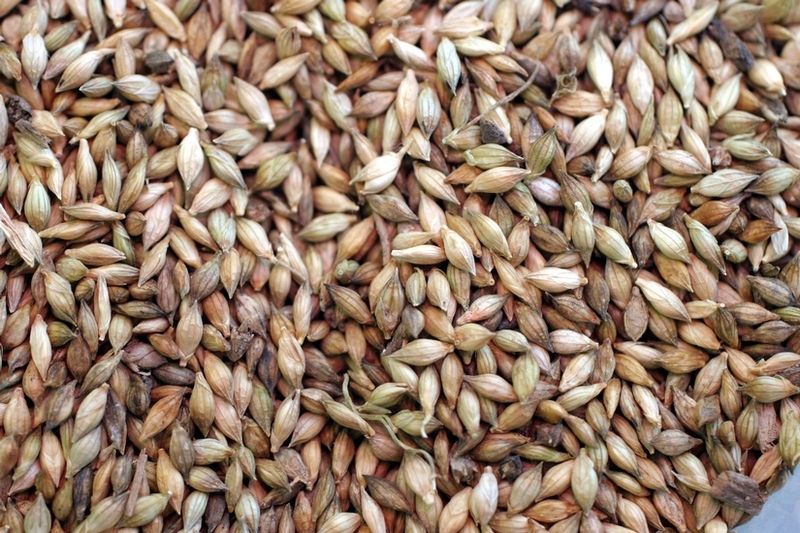 The fairly large seed from which seedlings arise also helps in the identification of this species. Leaf blades range from 3 to 11 inches in length and may reach as much as 20 mm in width. Leaves are covered with short, soft hairs on both surfaces. 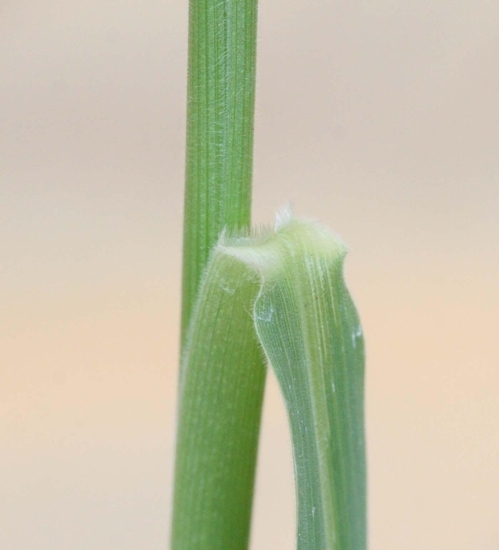 Auricles are not present and the ligule is membranous and fringed with hairs, from 1 to 1.8 mm long. May be erect to as much as 32 inches in height or may grow close to the ground with tips ascending (decumbent growth habit). Stems may reach as much as 4 1/2 feet in length and plants can root at the lower nodes. Stem nodes are distinctive and are also covered in soft hairs. Seedhead a simple, narrow panicle that ranges from 2 3/4 to10 inches in length. Each spike has 2 rows of spikelets that are each approximately 3 mm long. Roots are fibrous and plants may root at the lower stem nodes. A summer annual with relatively wide leaves that are covered with soft minute hairs on both surfaces. Texas panicum is very similar in appearance and growth habit to Broadleaf Signalgrass (Brachiaria platyphylla). However, broadleaf signalgrass has hairs only along the leaf margins unlike Texas panicum. 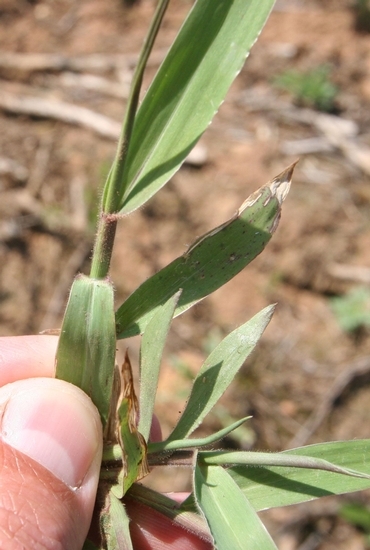 Additionally, the two can be distinguished in the seedling stage by the lack of hairs on the leaves of broadleaf signalgrass compared to the small velvety hairs on both leaf surfaces of Texas panicum. 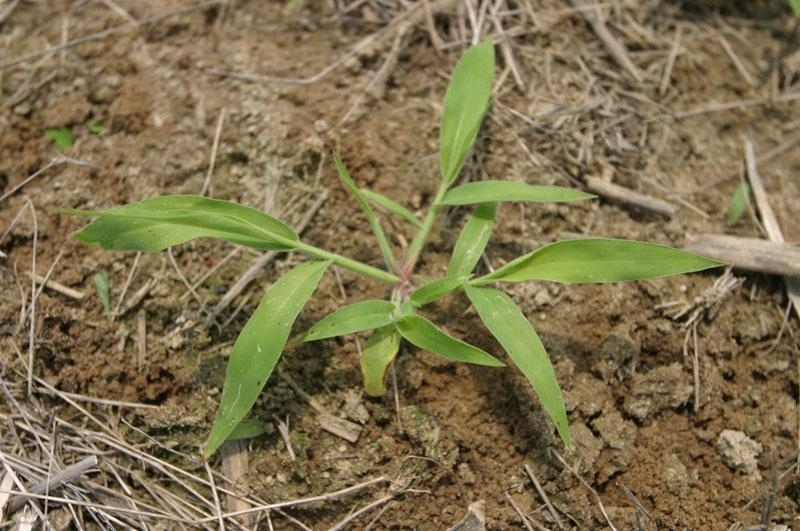 Texas panicum seedlings also very closely resemble Large Crabgrass (Digitaria sanguinalis) in appearance. Once ligules become noticeable, however, the two can be readily distinguished from one another. 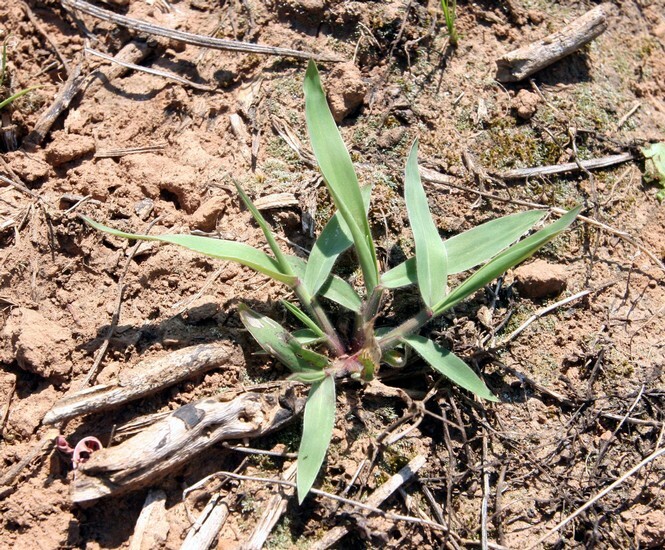 Large crabgrass has a relatively tall membranous ligule with jagged edges while Texas panicum has a ligule that is membranous at the base but fringed with hairs on the top.